AG Report - Havey H. Huggins mustered with the 17th on January 4, 1862 a Calhoun for a three-year enlistment. He was mustered out with his unit in Louisville on January 23, 1865 in the rank of 1st Sergeant. 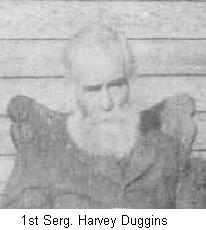 He was a private in Company E prior to consolidation; promoted to Sergeant November 1st 1863; to 1st Sergeant May 15, 1864. He entered the Union Army on October 28, 1861... He was a farmer that lived all his life near Short Creek in Grayson County, Kentucky. He contacted scurvy during the Civil War but returned to duty. He could read and write and fill out his Pension forms for his Civil War Pension. Ernest Duggins, son of Jesse Warren and grandson of Harvey, says Harvey was crippled with a broken leg and hip during his last years of his life. He was injured by the wind blowing a barn door against him and hurting his leg. He regained enough use of his legs to walk short distances with the use of a cane. Ernest said he (Harvey) loved to rabbit hunt. 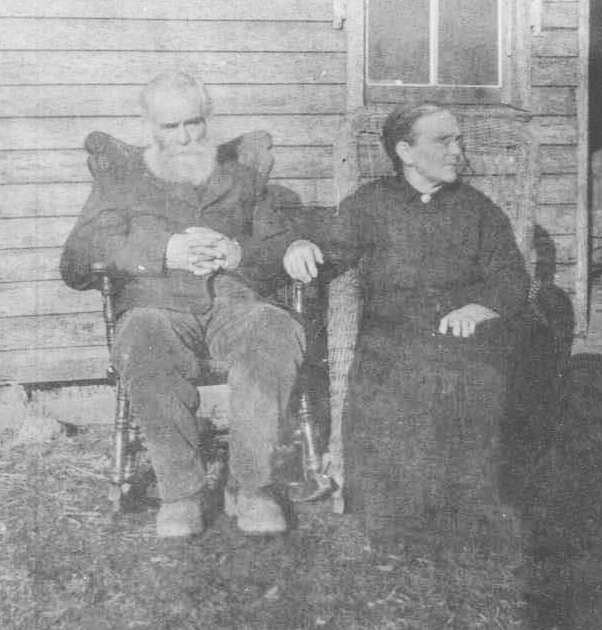 After he was hurt and had difficulty walking, he would ask Ernest to take his chair and shotgun to the apple orchard. He would then sit in his chair and wait for a rabbit to appear. When it did he would shoot it and call Ernest to get it and bring it to him. He would then skin it and prepare it for supper.